Purging the Bad Guys: A How-To Guide for Egypt, Tunisia | Jordan Ink. Nudged forward by a desire to join the European Union, new elites tackled the question of what to do with the key perpetrators of the ancien régime — plus all the loyal foot soldiers who propped it up. The key question: Beyond the secret police, how deeply to cut into the old elites, public administration, bureaucracy, courts, economy, army and regular police, even in the media and universities? In each country, it began with lustration: a legalized “controlled purge” of collaborators. These lustration laws — the name derived from lustrum, the purification rituals of ancient Greece and Rome — were forged in the newly democratic parliaments of Eastern Europe. Crucially, though, they were hammered out by all factions — even the vanquished communists, by then reconstituted as socialists. While the terms “transitional justice” and “lustration” are relatively new to the human-rights lexicon, the concept is not. Experts trace its origins to the de-Nazification of post-war Germany and the Nuremberg Trials. Yet the postwar period is also considered a prime example of “victor’s justice,” when the United States and its allies imposed their will on Germany and Japan. While such a situation is quite different from where a country’s own people overthrow the regime — as in Eastern Europe, Egypt, and Tunisia — it nevertheless set a benchmark for one way to handle the messiness of such transitions. Six decades later, the application of victor’s justice during the “de-Baathification” of Iraq was widely panned as over-zealous and counterproductive. Some 400,000 army and police officials were swiftly booted into the streets, and many went on to form the heart of myriad insurgent groups. More successful transitions create a forum to end impunity for the worst abusers and extract apologies for excesses of the former system, says David Tolbert, president of the International Center for International Justice. “It’s important to have a confrontation with the past, hold accountable those responsible, have the victims’ suffering heard and recognized, then reform institutions so it doesn’t happen again,” says Tolbert, who has participated in a tribunal in Lebanon, the Khmer Rouge Trials, and as deputy chief prosecutor of the International Criminal Tribunal for the former Yugoslavia. Recent years have seen transitional justice embodied in host of truth and reconciliation commissions, most famously in post-apartheid South Africa, but also everywhere from Argentina and Guatemala, to Rwanda and Sierra Leone, to Cambodia and East Timor. No two transitions are the same, and observers compare them with great caution. Yet post-authoritarian Eastern Europe seems the closest parallel for Egypt and Tunisia. At least Eastern Europe had tasted a democratic spirit of the interbellum between World Wars I and II, and a second time, before local Communists — backed by Moscow and its occupying Soviet forces — crushed the postwar resistance. Egypt and Tunisia — and Libya, for that matter — can draw from no such historic memory. Their countries, even through the post-colonial period, passed from strongman to strongman. Nevertheless, both Eastern Europe and Northern Africa, after decades of being brutalized, have mustered the courage to demand change. Still, it would be a stretch to say that all former communist countries have experienced “de-communization.” Russia elected (and re-elected) Vladimir Putin, despite his KGB past. Alexander Lukashenko of Belarus, branded “Europe’s last dictator,” has even kept the KGB name for his intelligence services. To this day, most ex-Soviet Central Asian republics are ruled by former communist apparatchiks. Each country tackled these tough questions in its own way. 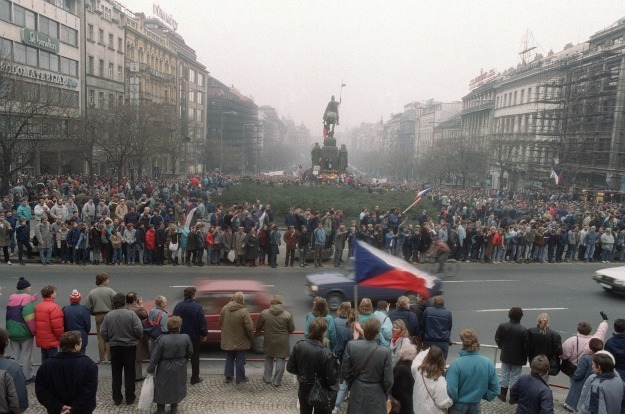 The Czechs purified with “radical” lustration in commissions that screened and delved into the backgrounds of more than 400,000 Communist Party rank-and-file. In a country of just 10 million people, 3 percent were identified as informants. The country then banned more than 9,000 ex-party functionaries from most publicly elected or politically appointed offices, from jobs such as judges and prosecutors, and from top posts in state-owned companies, media, and universities. Some critics said this cut too deeply, eliminating officials with much-needed “expertise” to help manage the transition to capitalism and democracy. But Stan suggests that experience can be overrated. After all, the Czech Republic never lost its primacy as a front-runner to join Western institutions like NATO and the EU. In fact, the risk that officials from the old system will work to undermine the transition may be just as great as the lack of experience. In contrast, Poland and Hungary opted for “confessional” lustration. Collaborators who admitted their role could keep their job. Many did, for refusal ran the risk of embarrassing exposure, should their file wind up in the hands of certain historians, journalists, or politicians. Those who didn’t faced the risk of public outing: In January 1996, Polish Prime Minister Jozef Oleksy was forced to resign after accusations he had spied for Moscow. In 2002, conservative media in Hungary nearly brought down the socialist Prime Minister Peter Medgyessy, with revelations of his counterespionage. In January 2007, the newly tabbed Archbishop of Warsaw was outed as an informant, prompting him to quit. Meanwhile, the ex-Soviet Baltic republics — Lithuania, Latvia, and Estonia — are an anomaly among communist-turned-EU countries. The accusations, provocations, and bare-knuckle politics have been mostly directed at a common external enemy — Russia, says Nikolai Meinert, an Estonian journalist now working for the Latvian News Media Group. Nevertheless, the Baltics purged many of their own officials, whom they accused of fealty to Moscow. In Lithuania, the “KGB Act” barred former agents from a slew of professions. Yet like any democracy, aggrieved Lithuanians had recourse. In 2004 and 2005, four low-level former agents took their case to the European Court of Human Rights, charging that the KGB Act violated their essential right to work. The court agreed. Punishing perpetrators of the past has been an emotional, divisive, and complicated process across Eastern Europe. Some individuals were justly exposed; others, not so justly. It’s also a process that never seems to end. Even earlier this month, the Hungarian Foreign Ministry announced the firing of seven officials accused of being communist-era secret agents. With so many challenges confronting a post-authoritarian transition, some East Europeans tried to avoid the unpleasantness of purge by preaching forgive-and-forget reconciliation. That approach may also tempt some leaders in post-Mubarak Egypt and post-Ben Ali Tunisia. The reverberations, though, are inevitable, says Aleks Szczerbiak, a Polish professor of politics who co-authored the Sussex European Institute report. “The problem is, the post-communist experience suggests the past does not just ‘go away,’ but can come back again as a source of divisions within society and as a salient political issue,” says Szczerbiak. How deeply any country should cut, however, “is the million-dollar question” says Stan, the political scientist. “There’s no one-size-fits-all,” adds Tolbert. Back in Egypt, some have already dubbed this the period of “de-Mubarakization.” It was telling that just days after Mubarak was toppled, some of his once-loyal police force was also out in the streets, protesting. Not just for better pay, but to save their hides. “I was following orders,” lamented one policeman, echoing a familiar historic refrain. Whether the public and new elites buy it remains to be seen. On March 7, the Egyptian authorities ordered the arrests of 47 police officials for burning intelligence files. The rage in Egypt and Tunisia is such that a lynching or two would surprise no one. Yet some victims indicate they’d accept transitional justice over the vigilante version. Michael J. Jordan, a Bratislava, Slovakia-based freelance journalist, has lived in and reported from post-communist Central and Eastern Europe since 1993. He blogs at https://jordanink.wordpress.com. Tina Rosenberg, the author of the “The Haunted Land: Facing Europe’s Ghosts After Communism.“ is right. But the Stalinist mentality, not the original proletarian fictional ‘equality’ is too deeply rooted in Russian minds where it remains tighly linked with Russian historic imperial aspirations. So, Lenin’s statues remain all over the land, Lenin’s and/or Red Star medals remain widely treasured possessions, Lenin’s NKVD-KGB remains after being renamed FSB, the Komsomol youth now operates as Putin’s “Nashi” and the whole Kremlin apparatus is run by the former KGB brigade leaders. Even if the Russian system may no longer be called communism, it remains a renamed version of the same.